What Trump Got That Romney Didn’t Ideology isn’t enough to provide the unity America needs. The other night I came across an internet exchange I’d had last June with a talented writer and editor, a journalist who is also conservative. The journalist mentioned how some of those writing on Donald Trump this year seemed to have replaced logic with emotion, even becoming “unhinged.” I agreed. It was a hot year, full of pressure, anger and stress. Which is more or less where I wound up in November. I’d forgotten the exchange. But it was seeing the reference to our catastrophes, which I’ll quickly define as “The unhelpful and even ugly ways our country has changed the past 30 or so years, the chafing divisions and antagonisms, the myriad injustices and declines”—made me think, again, of a fear I’ve had for more than a decade. It’s the fear that a nut or group of nuts gets lucky, breaks through our defenses, and hurts us, badly. Lines go down. Anxiety is high and sustained. National unity—our ability to remain together as a people—will at that point be everything. All will depend on Americans helping each other and sticking together—that’s how we’ll get through it—and not turning on each other. And so I think what helps in this area should be encouraged—what ties we have strengthened in all spheres, neighborhood and government, personal and public. When I write on politics these things are usually in the back of my mind. When you think like this, it is by its nature prioritizing. It makes you see secondary crises as secondary. It leaves you worrying less about things that won’t immediately kill us. These thoughts came very much to the fore of my mind in the 2012 presidential election. I had since the 2000s seen a considerable amount of cultural chaos on the ground in America, and both witnessed and known of struggles made sharper by the crash of 2008, an event still not fully appreciated for its seismic impact on the American psyche. Mitt Romney was running for president and made his famous, secretly taped “47%” remark, in which he suggested he’d get no support from voters who depend on government and don’t pay income taxes. I came to think that year, in 2012, that Republicans were no longer considering the circumstances. I think Donald Trump and many around him have it right, that the Republican Party should shift its emphasis to become a center-right party. One of the most interesting comments at the recent Kennedy School postelection conference came from Mr. Trump’s pollster Tony Fabrizio. People don’t get Trump, he said, because “we really live in a world where everybody thinks that ideology is linear, and that ‘If you answer these 10 questions correctly, that makes you a conservative.’ ” He added, “many people tried to look at the Donald Trump phenomenon through the ideological lenses which had defined previous Republican presidential nominating contests.” But “Donald Trump is postideological.” Which, he said, is why so many Bernie Sanders people liked him. 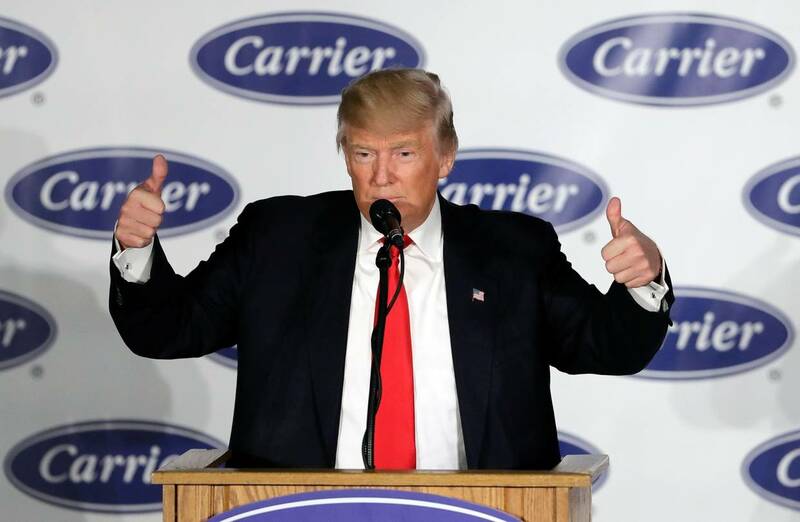 I see conservatives debating the Carrier decision—the implications of an incoming president persuading, inducing, perhaps to a degree pressuring a company not to leave Indiana. A factory will stay, and perhaps a thousand jobs. It’s not something that can work every day or be done every day, but it’s the right sympathetic symbolism. It’s not bad if people see a shift in decision making from abstract dogma to literal, concrete reality. It’s not bad if someone thinks the federal government is on their side for a change. In fact, it can be unifying.